Paul Lehto practiced law in Washington State for 12 years in business law and consumer fraud, including most recently several years in election law, and is now a clean elections advocate. His forthcoming book is tentatively titled DEFENDING DEMOCRACY. In the past, I co-founded but am no longer an active participant in the San-Diego focused election rights organization Psephos, but I nonetheless recommend their work and reference their site here. 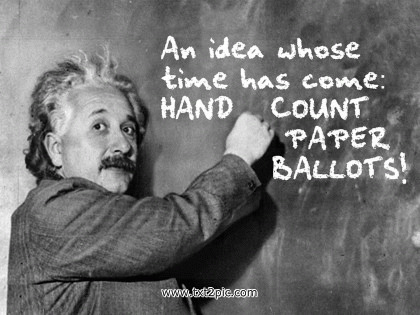 Germany bans computerized voting; will hand count in 2009 Hand counted paper ballots to be used now in Germany's 2009 elections -- computerized secret vote counting banned by constitutional PRINCIPLES! If you like sending cash through the mail, you'll LOVE vote by mail! Vote by mail ends the secret ballot, results in actual votes being changed through pressure and intimidation,is nothing less than the complete privatization of what is supposed to be a public process, and then ballots sit around for a long time for things to happen to them like getting "lost" altered,or damaged.If you like sending cash through the mail,you'll love vote by mail. GOP Voter Reg Fraud EXPANDS to OUTRIGHT Document Forgery REPUBLICANS FRAUDULENTLY SWITCHING PARTY REGISTRATIONS, FORGING DOCUMENTS: PERJURY CHARGES FILED; ONE ARREST MADE SO FAR. US Sup. Ct. Rules on Ohio 2008: Wants to See Vote Counts before Final Ruling Today's stay merely means that the law and facts are not sufficiently clear that a court would be justified in issuing injunctive relief like a TRO at this juncture, just prior to the election. It preserves the status quo, but the Republicans are poised to challenge the Ohio election and have votes thrown out as illegal votes wherever possible. Will we see Ohio's votes thrown out, as happened to Florida in 2000? "Insulating Main Street from Wall Street" Means America's Keys in Wall Street's Pocket The modified bailout plan, purporting to "insulate" America from Wall Street's crisis, actually puts Wall Street in control of its own reform and bailout, and removes any chance of taxpayer accountability while claiming to create an "Oversight" Board, in a way much worse than the original proposal, all sold to the American people as a protection of their interests. A permanent chill for American democracy. Election machines are no friend of democracy The only party without conflicts of interest is the public,but the public needs transparency to provide checks and balances.Secrecy invites corruption.Secret vote counts by insiders represent a form of unaccountable,absolute power where the public can't remove politicians from office if an insider is willing to cheat.Secrecy insures we'll never know cheating occurs.Whatever happens openly,what happens under secrecy is worse. Defending the Freedoms of July 4, 1776: America's Hope for the World Restating the history and importance of the American Revolution and applying it to the situation today, all Americans are presented with an incredible opportunity to come to the aid of their country that we can all feel good about. Let's give America a birthday present this July 4, 2007 and every day thereafter. Ultimate Nightmare for Democracy: High Confidence Yet Total Fraud Paper ballot/trails create the gold standard for voter-verified FRAUD AND MAKE IT ALL SEEM LIKE IT'S A LEGITIMATE ELECTION . The riggers are then laughing their butts off with delight at this state of affairs, knowing that while perhaps at most 10% of errors get caught, 90% are voter approved and therefore legitimated. ELECTIONS HACK TEST: Counter-Challenging Elections Officials on the Truth Responding to a "hack challenge" by Riverside Supervisor Jeff Stone that mimicked "voter fraud" conditions, a counter-challenge is issued that is more realistic: INSIDER election fraud. The real conditions to mimic the power and access of elections officials are identified, the counter-challenge is issued. The "All or Nothing Approach:" Should It Apply To Democracy? this article applies to vote counting and voting systems the legal and political perspective of democratic rights. It shows that almost all of your meaningful rights in the area of voting and vote counting have been taken away, and Congress instead of correcting that is about to institutionalize it. 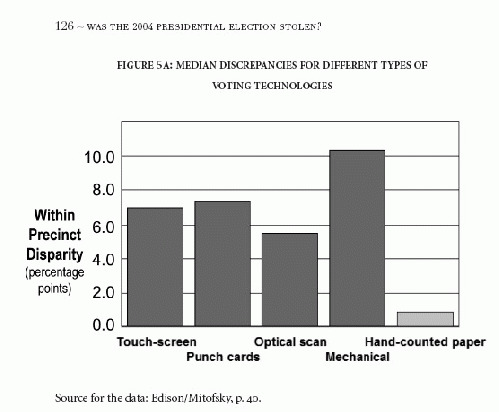 New York City Change To Optical Scan Elections: Not the answer, but getting closer New York City's decision to dispense with DREs and go with optical scan systems "with paper ballots" is a marginal contingent improvement, but is being celebrated as a Hallelujah moment by some. False confidence, though, is the very best place to grow a fraud.